Our fathers were unwilling to be obedient to him, but repudiated him and in their hearts turned back to Egypt (Acts 7:39). A whole generation saw their home as Egypt and not the Promised Land, because they saw themselves as slaves, not sons. How do we see ourselves? Are we looking to our past to define us, or are we believing what God says about us and looking to our future? The fact is, we tend to look the way we’re going. They were generations of slaves. They had no understanding of freedom, and no understanding of godly leadership – they had to do what the taskmasters told them to do. They had no connection to God as Father, and had lost sight of their covenant family identity from Abraham, Isaac and Jacob. They had no sense of belonging, no sense of heritage, no sense of purpose. They had riches, because they came out with the gold of Egypt, and yet they had no wealth. Money does not bring happiness or fulfilment, and it does nothing to root out an underlying poverty mentality or an orphan spirit. They had no loyalty either to God or to Moses, no faith or trust in God, and as a result they all died in the wilderness except Joshua and Caleb – including Moses himself. Joshua and Caleb had a different spirit, and a different relationship with God. They knew him as Father and were able to enter in, taking the next generation in with them. He will restore the hearts of the fathers to their children and the hearts of the children to their fathers, so that I will not come and smite the land with a curse (Mal 4:6). God’s desire is to turn our hearts back to our Father in heaven, and to see that His heart is for us. This is a fatherless generation, a strategy of the enemy to steal destiny by separating and removing fathers from their families, but we do not have to be part of it. We do not need to have an orphan spirit. A son or a slave? Let’s ask ourselves, do we think and act like a son or a slave? It may not be black-and-white: perhaps sometimes we think and act like sons but then slip back into thinking and acting as slaves. De we identify with slavery or sonship? Do we know our identity as a son, our royal identity as a son of the king? God wants to heal your father- (or mother-, or other relationship-) wounds. He wants to remove the scars that are on your life. He wants you to have a home in Him. He wants you to know you are adopted, accepted, and loved. He wants you to know and fulfil your destiny. Will you allow God to be your Father? Or will you allow your relationship with your earthly father to rob you of that intimacy? Will you trust Him with your heart? If your heart has been damaged, if you have been betrayed, disappointed, let down and hurt, then it is no small thing to trust someone with your heart again (even if that someone is God). It is a choice, and a choice that comes with risk attached. Will you allow him to deliver you from an orphan spirit? Will you lay down your old natural identity? Will you pick up your new supernatural identity? If you will, then stand and speak these declarations out loud (if you can’t do that now, please be sure to come back and do it later, because speaking these things out carries power). When we have made these declarations, God is going to minister to us and speak to us in our hearts. I choose to allow you to heal, deliver and restore me. Now receive what God is going to do for you. In the authority you have released I loose each person who made those declarations from an orphan spirit and a spirit of slavery and a spirit of rejection. I pray for the power of the anointing of the Holy Spirit to break those yokes, destroy those burdens and loose them from the control of their mind, their emotion and their will, from that orphan spirit and that spirit of slavery. I loose them from it in Jesus’ name, in the power that Jesus is releasing today under an open heaven. Now I want you to close your eyes for a few moments and see with the eyes of your heart the scars that may be over your heart from the past. You may picture them, you may feel them, or just sense that they are there. ‘I love you my child – I love you, I love you. I love you my child – I love you, I love you. I love you my child – I love you, I love you’. Over and over, hear Him repeat those words. Allow His words of love and acceptance and affirmation to heal the wounds and remove the scar tissue from your heart. I invest you with the authority as a prince (or princess) to subdue, rule, and manifest My kingdom on earth as it is in heaven’. Receive that into your spirit. Let your spirit embrace and begin to expand and grow and mature. Let it bring God’s blessing into your life. Receive a revelation of who you truly are as a son of God, and allow Him to continue that process of conforming you into His image, into the image He always had of you from eternity, into the image of Jesus. A son of God, taking up the full responsibility of who you are in the heavens and on earth. God’s desire is for you to truly know that you have a home, that you have a family, that you are accepted, that you are loved. Author Freedom ARCPosted on Monday 11 April 2016 Tuesday 12 March 2019 Categories Destiny: IdentityTags choices, destiny, inheritance, love, obedience4 Comments on 208. Whose Slave Are You? The mantle of praise instead of a spirit of heaviness. Every 50 years in the Jewish calendar there was to be a Year of Jubilee (or freedom), when everyone had their inheritance restored to them. That is the ‘favourable year of the Lord’ that we are called to proclaim. God wants all his people to have everything restored to them. We will receive liberty in exchange for captivity, healing instead of brokenness, beauty for ashes, double honour for shame, the oil of joy instead of mourning. The time for mourning is over. It is time to know the fullness of joy in our salvation. God is looking to restore all things to original condition, including us. He will restore us not to the condition we were born in, but to His original intention for us, all those wonderful plans He has had for us from eternity past. He wants us to know our identity – who we really are. He wants us to know how He designed us, to know how we were made to be. And He wants us to grasp our destiny, our birthright, all that we are called to do. I encourage you to take some time out now. Imagine that Father God is standing before You. He is calling you to your destiny. Picture yourself walking towards Him. Come in repentance (‘metanoia’: changing the way you think about yourself – and everything and everyone else – and instead, thinking as He thinks), with your head bowed, as a servant, because that is how we all come at first. Now, look up. See the Father waiting with His arms wide open, with love in His eyes for you. Look into His eyes of love. A seal, a signet ring you can use as His representative, with His authority. How clean and fresh they feel! You have been declared righteous, made right with Him. Just as God opened up the heavens to speak over Jesus, he has opened the heavens over you and is declaring this over you. I would urge you to listen with your spirit to what he is declaring. This is your Father speaking directly to your spirit, calling forth that eternal destiny He has placed within you. I declare you are my beloved son and I am well pleased with you. For your best interest and for My ultimate glory. And I have all the resources of the universe to meet that need. Feel your spirit pulsating with My life, My love, My acceptance. To hear what they say about you. Spiritually, emotionally, mentally, physically, and practically. I am your inheritance and you are My inheritance. I give you access to the river and tree of life in your heavenly home. You are my child and I call you to be displayed as a mature son on the earth. Let your spirit receive those words. Go over them again and again, day after day if you need to. Receive them as an affirmation of who you are as a son of God, as a child of your heavenly Father, as one who has a destiny in Him. Allow your spirit to just soak in it. Soak in the words of God to you. He approves of you, blesses you. He wants you to know your identity, and outwork it. He wants you to know your destiny, and fulfil it. 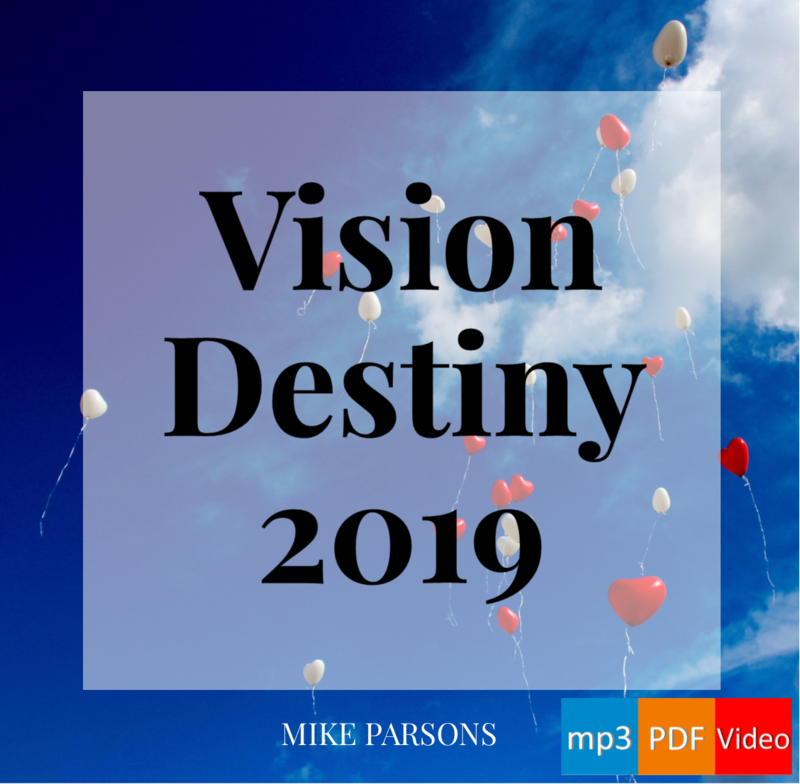 Destiny: Identity mp3 audio teaching series by Mike Parsons (this post has again been drawn from the closing section of session 1). We all have an individual inheritance from God: destiny, birthright, calling, purpose – there are many names we give it. And God has created us all different, designed us to operate best in particular ways, which we need to discover and understand. We all have an identity, and that identity is as sons of God (including the ladies), but we all start out as spiritual babies who are on a journey quest to discover answers to these questions. This series of posts which we are starting today is all about that journey: a journey from the slavery of childhood and infancy to the maturity of sonship. We must leave behind the slavery of a poverty mentality. When we are born, we inherit a sense of separation from God: we do not know who He is or who we are created to be in Him; we do not know the wealth He has for us in relationship with Him, so we think like paupers. I am not really talking about money (though money certainly comes into it), but about knowing our royal identity. Someone who is of royal birth thinks very differently to someone who is not, and we have to learn to think like a child of the King of kings. Only when we think that way can we act that way, able to fulfil our calling and come into our destiny. We are in a training process, intended to produce that maturity in us. We start out as servants, then as we complete the training, go on to become bond-servants, stewards, friends, lords, kings and sons. Increasing levels of authority and power come with increasing levels of relationship and responsibility, as God entrusts more and more to us. How much do we desire that? How willing are we to pursue that, to pursue Him? It will take diligence, faithfulness and perseverance. It does not come easily. As you would expect on a quest, there is opposition along the way; opposition to us knowing who we are and why we are here. When the children of Israel crossed into their Promised Land, they had to dispossess the nations who were there before them. There are things in our lives which need dispossessing too. There is a battle, but that battle to possess our inheritance will bring us into more intimacy with God. He has designed it so that we find Him in the difficult times, in the trials, where we learn His faithfulness; where we learn that He overcomes – and that through Him we too can overcome. Now I say, as long as the heir is a child, he does not differ at all from a slave although he is owner of everything… But when the fullness of the time came, God sent forth His Son… so that He might redeem those who were under the Law, that we might receive the adoption as sons (Gal 4:1-5). Because you are sons, God has sent forth the Spirit of His Son into our hearts, crying, “Abba! Father!” Therefore you are no longer a slave, but a son; and if a son, then an heir through God (Gal 4:6-7). Every one of us is an heir of the fullness of God’s kingdom as His sons; but if we think like slaves, we will not act like sons. For those whom He foreknew, He also predestined to become conformed to the image of His Son, so that He would be the firstborn among many sons; and these whom He predestined, He also called; and these whom He called, He also justified; and these whom He justified, He also glorified (Rom 8:29-30). We have a destiny already agreed, to become like Jesus. It was impossible for us to fulfil our call and destiny when we were living restricted by sin; but all things are possible for us now that we are forgiven, now that we are justified, made right with God. And glorified – that was the part we used to think would only happen after we die, but the revelation God is releasing in our day is that we can be glorified here and now. We can access the realms of glory and the realms of heaven in order to bring heaven to earth through our lives. “I will be a Father to you, and you shall be My sons and daughters”, says the Lord Almighty (2 Cor 6:18). I get the impression from the way God phrases this that He is pretty serious about it. It is not open for discussion or negotiation. It is like that song we sing, ‘You Won’t Relent’: God will not relent, He will not let up, until we are His sons and daughters. We can no longer be content with living as slaves or orphans: we must pursue our sonship. God has blessed us, just as He blessed Adam and Eve, with every spiritual authority to bring heaven to earth. We can access those spiritual blessings in heavenly places, in Christ, to manifest them here on the earth. God always intended to choose us, from before the foundation of the world. He wants us as His children. That is His will, and he is not going back on it. God is calling forth our spirit to maturity. He is calling each of us to our identity as sons. Let us each begin to embrace the fullness of what it means to be a child of God. Destiny: Identity mp3 audio teaching series by Mike Parsons (this post has been drawn from material in session 1). SoundTrack: Identity in A (SML Music) – Engagement and activation music by Samuel Lane from Freedom Church.